The first was to try to make organs which suited the music; we were determined to be part of the Early Music movement and to transfer its search for authenticity to the church music world. The second was to revive interest in the classical English organ; at that date most of the organs on which one could play the music of the 17th and 18th centuries were altered beyond recognition. And the third was to restore historic organs using the same considered approach and methods as were used on objects in museum conservation departments. It was Martin’s practical genius which enabled us to fulfil those aims satisfactorily. He had that combination of curiosity, knowledge, dexterity and amazing persistence that the best craftsmen need to produce the right result. There are few organ builders who can design and make the entire instrument using their own brains and hands to the standard to which Martin could. His curiosity extended well beyond the techniques of the craft. He was interested in church music, singing and playing the organ himself. He was interested in church architecture, in liturgy, furniture design, etc. He could see the bigger picture and developed a taste of his own. We were fortunate enough to be involved with some wonderful projects in our time together. Neither of us would have been able to choose our favourite, but I do know that the restoration of the 1709 de la Viña/ 1865 Machado organ at the Monasterio de Santa Clara in Santiago de Compostela in NW Spain was high on his list. We agreed that if this project had come to us when we were in our 20s we would never have come back to England. Martin was also very enthusiastic about the organ he visited on behalf of the British Embassy and the Santiago Museum, the 1854 Benjamin Flight organ at Santiago Cathedral in Chile, one of the last and one of the largest GG organs, in remarkably original condition, but barely playable. While he was advising the local craftspeople on the correct way to treat the organ, he met José Manuel Izquierdo König, who aided and abetted his activities, came to work with us for a few months, and wrote a book about the organ: José Manuel Izquierdo König El gran órgano de la Catedral de Santiago de Chile: música y modernidad en el Chile Republicano (1840 – 1860) (Santiago: Ediciones Pontificia Universidad Católica de Chile 2013) – available on Amazon. One of his dearest wishes would have been to assist in the restoration of that organ. I have also included one of Martin’s early drawings, when he was still using a Rotring pen. 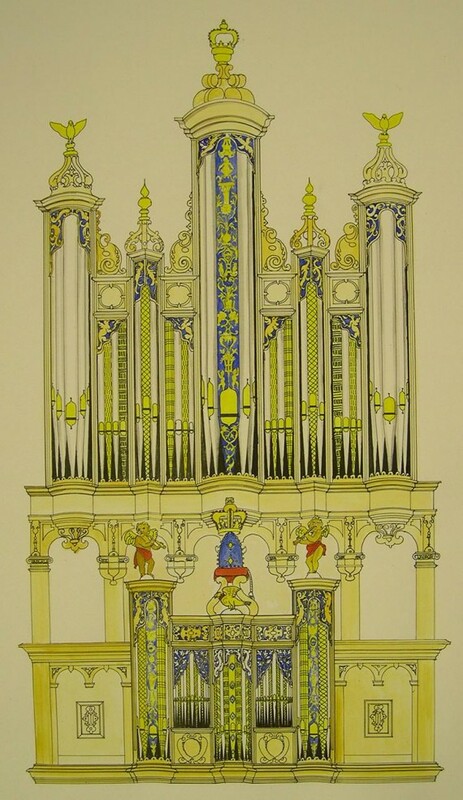 There is also a coloured drawing of his reconstruction of the organ built by the Dallams for Magdalen College Oxford in 1631 or thereabouts, now at Tewkesbury Abbey and Stanford on Avon near Rugby in the ‘research and design’ page, presented by BIOS to their retiring Chairman, Peter Williams. (I will always regret that we never built a reconstruction of an early 17th century English double organ together.) Martin had a genius for draughtsmanship, which made me wonder why he was so keen on CAD drawing. He could visual a drawing on the blank page so that the accumulating details were never themselves out of place, nor did they put everything else out of place. And his drawings looked most attractive, in a way that the CAD never quite can. I first came across Martin Goetze when Martin & Dominic exhibited a small organ at the St Albans Organ Festival. As a result they were invited to bid for a new two-manual organ for the English Church in The Hague. Having won the bid against Dutch competition, Martin designed a superb English eighteenth century-style organ with an excellent oak case of the same period, all made in-house including the carving. This was followed by a difficult project, restoring a mid-eighteenth century organ that had been rebuilt too many times. In the event the historic case, pipework and original soundboards inspired the otherwise new three-manual instrument for St Helen’s, Bishopsgate, City of London. Another organ that had been rebuilt too often was the Gerard Smith organ in St Lawrence Whitchurch, in Middlesex. It would certainly have been played by Handel when he was employed by the Duke of Chandos. The surviving case and two ranks of Smith pipes were the inspiration for an otherwise new instrument in a style that would have been familiar to Handel yet suitable also for present-day Anglican worship. I first met Martin in 2007, when he came for the second time to Santiago de Chile. Martin’s first visit was in 2003, and then I still lived in the south, far away from the capital. 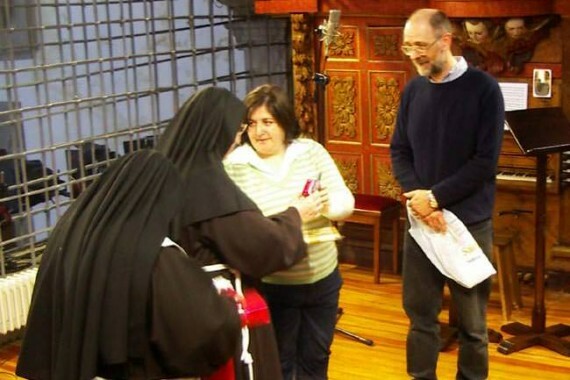 Maria Elena Troncoso, in charge of the heritage of the cathedral, asked for the support of the British Embassy regarding the English Organ that had been unplayable for decades. It was a three manual, 1849 instrument by Benjamin Flight & Son. The Embassy asked for a specialist to the Royal College of Organists and Martin was sent on a dreaded 24 hour flight, to the end of the world! The experience with Martin in 2003 was wonderful, and a good number of young people were enthusiastic about following the career of organ building. 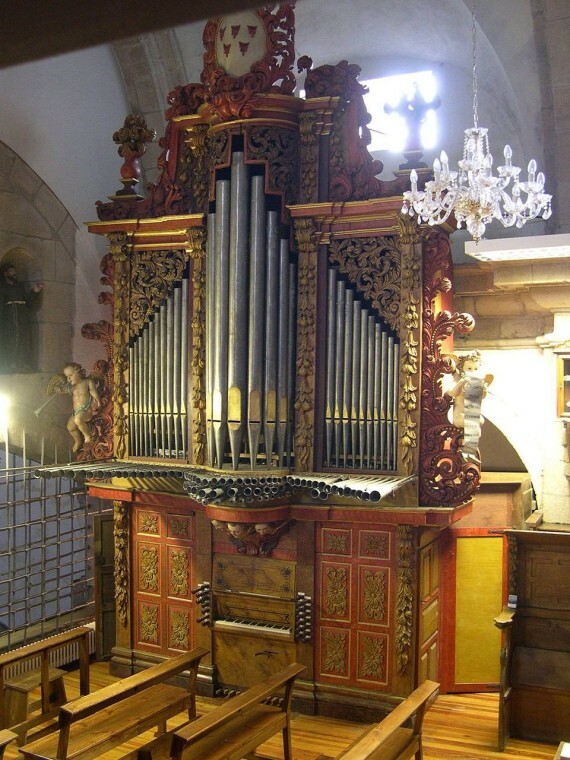 Two other organs he visited, in La Merced and the Anglican church of Valparaiso, were later restored and are now playable. However never again was there money for a proper restoration of the Flight & Son, and that is still the case. A strange group of amateurs (myself included) was assembled to protect the organ and, as far as possible, repair it to be playable again. We made various fund-raising activities and contacted Martin for a second time, with the news we had enough money to pay for the tickets, hotel and food, but nothing else. We were deeply impressed when he accepted, and stayed even longer than we asked for. The idea was to have him explain a bit more about organ building, possibilities of local restoration, budgets and techniques. Martin came back on December 2007 and we had the best of times. He found that this group had made horrible mistakes, and used very unorthodox tools but instead of criticizing or turning straight back to England, he encouraged us to keep working, albeit if now with a bit more knowledge of what should not be done. He worked for many hours everyday in the organ, restored pipes with almost no tools and, after a while, the organ was sounding again and could even be played. In three weeks he deeply affected the cathedral, the musical world in Santiago and the heritage discussions in Chile. He was a gentle, kind man, of enormous knowledge, but never pretentious or pompous in any way, never showing-off, only caring about the perfection of his work. To see him working, and to appreciate the level of dedication he had to his craft, was a life-changing experience to us all, particularly for me, being then 22 years old. A few months afterwards, in 2008, he invited me to come for my summer holidays to work in Goetze and Gwynn. Because I had no money, he invited me to stay in his house and, in a way, his family became part of mine, until today. The same humble, total dedication he had for organ building he gave to every single part of his life and work, always concentrated, ruminating the best way to solve a problem. He sent me to know many organs and organ builders, and the constant comment I received across the country was that Martin was, arguably, the best all-round craftsmen in the organ building businesses. According to most of them, that was an understatement!